Regenerative Medicine Today welcomes Thomas W. Gilbert, PhD. 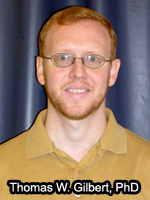 Dr. Gilbert is an Assistant Professor in the Departments of Surgery and Bioengineering at the University of Pittsburgh. His research interest are focused on the remodeling of biologic scaffolds for tissue-engineering based treatments, particularly relating to role of mechanical loading in the remodeling process. He has directed and participated in pre-clinical studies relevant to orthopaedics, cardiac, and gastrointestinal applications. He discusses his current research programs targeting tracheal reconstruction (with a particular focus on epithelialization and mechanical integrity of the graft) and tissue engineering approaches to pediatric congenital heart defects.